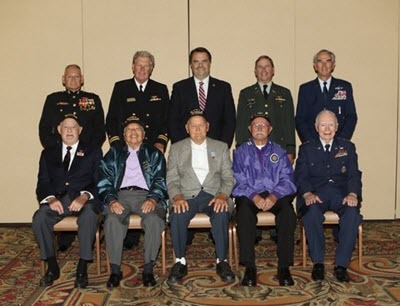 Five local veterans of the Korean War were honored on May 9 at a luncheon and symposium, The Forgotten War: Korea 66 Years On, co-hosted by Pierre Claeyssens Veterans Foundation (PCVF) and the Channel City Club at the Fess Parker a DoubleTree Resort by Hilton. While the Korean War is often overshadowed in history lessons by World War II and Vietnam, guests were reminded that the conflict triggered profound change both at home and abroad. During the event, special guest Korean Consul General Lee Key-cheol thanked the veterans for their service and honored all Korean veterans in attendance with the Ambassador for Peace Medal. Lee said South Korea would not have evolved into the democracy it is today without the efforts of those who served. He expressed remorse that so many have forgotten the war’s significance. Following a welcome from Channel City Club Vice President Brian Robertson and Pierre Claeyssens Veterans Foundation Co-Founder Lt. John Blankenship, USN (Fmr) and singings of both the U.S. and Korean national anthems, guests at the event were captivated by movie clips about the Korean War. Five presenters provided information on the history of the Korean War, which lasted from 1950 – 1953, but technically never ended as a peace treaty was not signed, only an armistice. Lt. Blankenship, Brig. Gen. Fred Lopez, Santa Barbara County Sheriff Bill Brown, Col. Phil Conran, and Capt. Joe Danely highlighted the cultural climate of the U.S. during the war as well as turning points in the military. The audience – which included the entire class of the Anacapa School – learned that aviation played a significant role in military operations during the Korean War. Additionally, it was the first U.S. war in which the armed forces were racially integrated. The war was also characterized by severe mistreatment of prisoners of war by Communist China and North Korea. Following the historical accounts, each of the speakers introduced one of the five local Korean War veteran honorees. Lt. Col. Jack Harris, USMC; Maj. Gen. Phil Conley, USAF; PFC Frank Heintz, Army; Sgt. John Suzuki, Army; and PFC Margarito Delgadillo, Army; each received standing ovations after their stories of service were shared with the audience. The five honorees were also presented with certificates of honor from Wendy Motta of the Office of Congresswoman Lois Capps, Cameron Schunk from the Office of Assemblyman Das Williams, Santa Barbara County Supervisor Salud Carbajal and Santa Barbara Mayor Helene Schneider. For information on upcoming veteran events in Santa Barbara or to support events such as this one that help ensure the men and women who have served in U.S. military efforts are never forgotten, visit www.pcvf.org.